Though it’s been just a few short weeks since we released a new set of features for Actions on Google, we’re kicking off our presence at South by Southwest (SXSW) with a few more updates for you. SXSW brings together creatives interested in fusing marketing and technology together, and what better way to start the festival than with new features that enable you to be more creative, and to build new type of Actions that help your users get more things done. This past year, we’ve heard from many developers who want to offer great media experiences as part of their Actions. 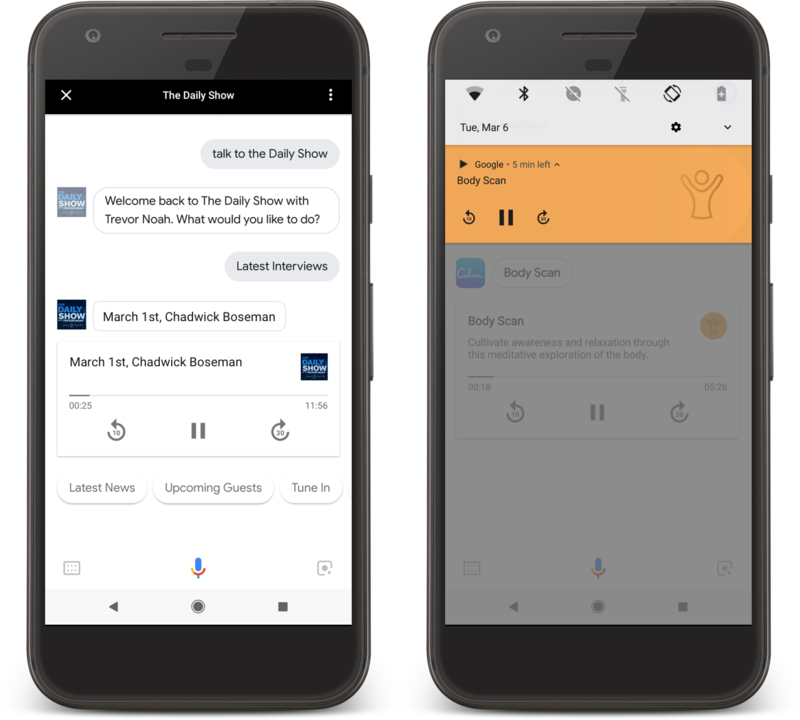 While you can already make your podcasts discoverable to Assistant users, our new media response API allows you to develop deeper, more-engaging audio-focused conversational Actions that include, for example, clips from TV shows, interactive stories, meditation, relaxing sounds, and news briefings. Your users can control this audio playback on voice-activated speakers like Google Home, Android phones, and more devices coming soon. On Android phones, they can even use the controls on their phone’s notification area and lock screen. Some developers who are already using our new media response API include The Daily Show, Calm, and CNBC. To get started using our media response API, head over to our documentation to learn more. And if your content is more visual than audio-based, we’re also introducing a browse carousel for your Actions that allows you to show browsable content — e.g., products, recipes, places — with a visual experience that users can simply scroll through, left to right. See an example of how this would look to your users, below, then learn more about our browse carousel here. While having a great user experience is important, we also want to ensure you have the right tools to re-engage your users so they keep coming back to the experience you’ve built. To that end, a few months ago, we introduced daily updates and push notifications as a developer preview. Starting today, your users will have access to this feature. Esquire is already using it to send daily “wisdom tips”, Forbes sends a quote of the day, and SpeedyBit sends daily updates of cryptocurrency prices to keep them in the know on market fluctuations. As soon as you submit your Action for review with daily updates or push notifications enabled, and it’s approved, your users will be able to opt into this re-engagement channel. Learn more in our docs. Actions for Google now allows you to access digital purchases (including paid app purchases, in-app purchases, and in-app subscriptions) that your users make from your Android app. By doing so, you can recognize when you’re interacting with a user who’s paid for a premium experience on your Android app, and similarly serve that experience in your Action, across devices. And the best part? This is all done behind the scenes, so the user doesn’t need to take any additional steps, like signing in, for you to provide this experience. Economist Espresso, for example, now knows when a user has already paid for a subscription with Google Play, and then offers an upgraded experience to the same user through their Action. 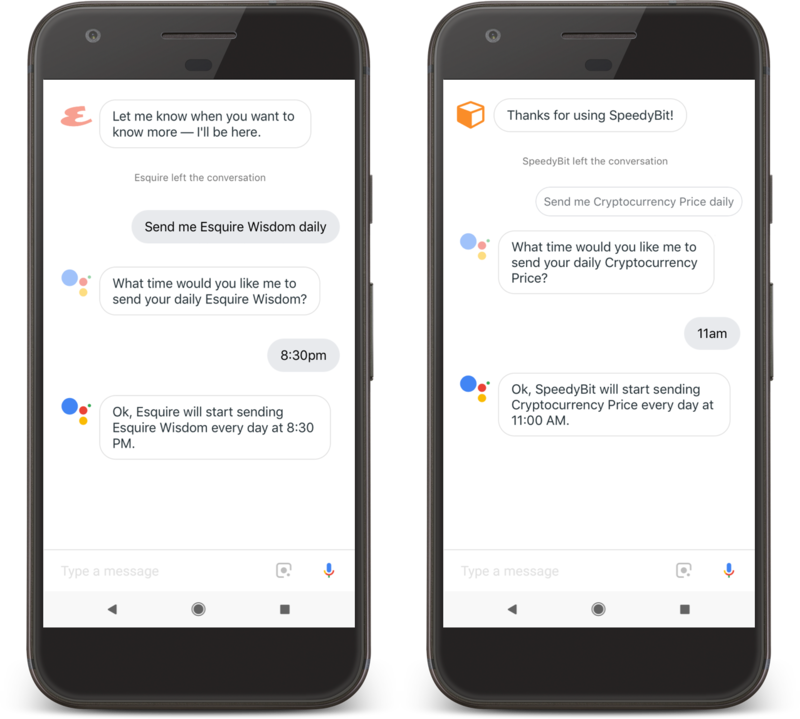 In December of last year we announced the addition of Built-in Device Actions to the Google Assistant SDK for devices. This feature allows developers to extend any Google Assistant that is embedded in their device using traits and grammars that are maintained by Google and are largely focused on home automation. For example “turn on”, “turn off” and “turn the temperature down”. Today we’re announcing the addition of Custom Device Actions which are more flexible Device Actions, allowing developers to specify any grammar and command to be executed by their device. 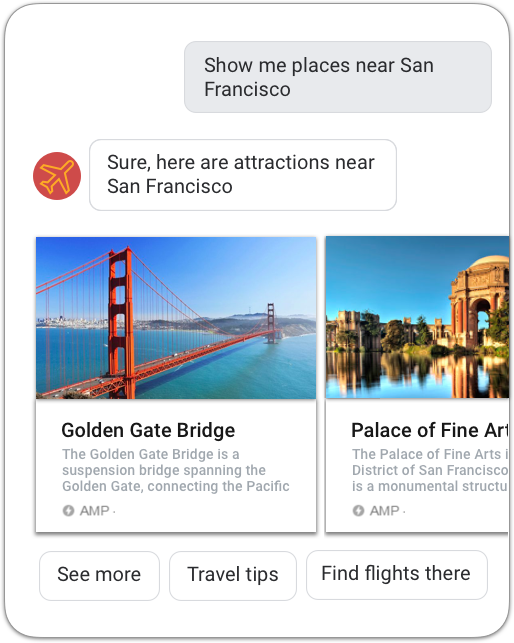 Once you build these Custom Device Actions, users will be able to activate specific capabilities through the Google Assistant. This leads to more natural ways in which users interact with their Assistant-enabled devices, including the ability to utilize more specific device capabilities. To give you a sense of how this might work in the real world, check out a prototype, Talk to the Light from the talented Red Paper Heart team, that shows a zany use of this functionality. Then, check out our documentation to learn more about how you can start building these for your devices. We’ve provided a technical case study from Red Paper Heart and their code repository in case you want to see how they built it. In addition to Custom Device Actions, we’ve also integrated device registration into the Actions on Google console, allowing developers to get up and running more quickly. To get started checkout the latest documentation and console. The code for all of these Actions is open source and is accompanied by in-depth technical case studies from each team that shares their learnings when developing Actions. We hope these updates get your creative juices flowing and inspire you to build even more Actions and embed the Google Assistant on more devices. Don’t forget that once you publish your first Action you can join our community program* and receive your exclusive Google Assistant t-shirt and up to $200 of monthly Google Cloud credit. Thanks for being a part of our community, and as always, if you have ideas or requests that you’d like to share with our team, don’t hesitate to join the conversation.